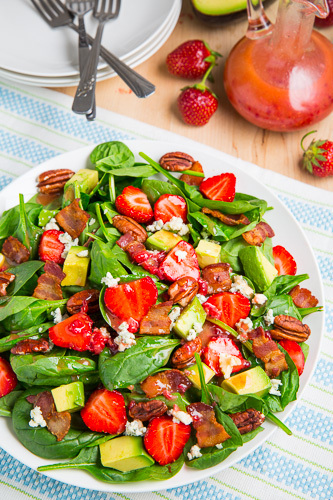 A fresh summer strawberry and baby spinach salad with avocado and bacon in a raspberry vinaigrette that just screams summer! Right now the markets are filled with fresh strawberries and raspberries and that made me think about one my favourite ways to enjoy them together, in this strawberry and avocado spinach salad with raspberry balsamic vinaigrette. 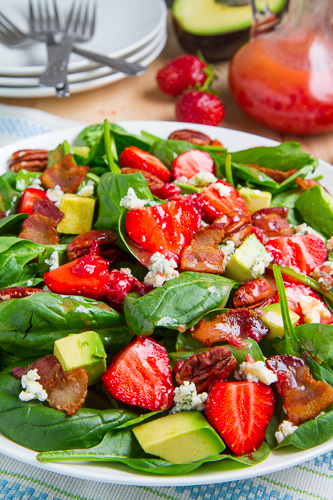 You might think that it is a bit odd combining strawberries in the salad and raspberries in the dressing but they work beautifully well together especially in a baby spinach salad with cool and creamy avocado, salty bacon and tangy blue cheese! Individually all of the ingredients in this salad are pretty amazing but combined they take things to a whole new level! This strawberry and avocado spinach salad in raspberry balsamic vinaigrette is so easy to throw together and it makes for a tasty treat of a light meal on hot summer days! This salad has been a favourite of mine for years and I am still making it many times every summer! It’s a beautiful salad! Great blog. I stop by everyday. Thanks! This looks like the perfect combination. Yummy. I love your addition of peas in this salad, yum! They would be really good with the strawberries and bacon. I have an award waiting for you on my blog!!! Once again, you’ve created a gorgeous dish with some of my all-time favorite ingredients – yum!! These look good! Very healthy with so much greens and fruits! I must confess that bacon is my weakness! Someday I’m going to come knocking on your door with fork in hand ready to eat. I think there isn’t a day go by that you don’t have something creative, beautiful, and delicious sounding on your blog! Honestly, a cookbook with your strawberry recipes could be a best seller, easily, as could a collection of mushroom ideas from your kitchen. Avocados and spinach are good separately, and amazing together! Lovely salad! Ooh those colors are gorgeous! The flavors look like they worked so well together. Mmm gotta get my hands on some fresh strawberries and avocados now! Thanks for visiting my blog tonight. You have some really nice looking salads on your blog. I remember eating peanut butter and banana sandwiches as a kid, too bad I didn’t think to add the honey. Will do that for my kids for sure. This salad looks amazing! This salad looks fresh and delicious! The dressing seems perfect and loved the addition of fresh peas. Better than restaurant looking! I love how colored it is! I big plate of this for dinner would be just lovely. strawberry, avocado and spinach..why i didnt thought about this, great flavors together! What a gorgeous salad, that dressing sounds good too. I often throw strawberries and nuts into salads, I like red onion with them too. Kev, you should start a salad book. The way you incorporate ingredients is endless. The strawberries have to be sooo refreshing. I love this combination for a salad….the bacon adds so much flavor. That salad, my friend is a meal…nice combo. A riot of color on a plate! Gorgeous! What a beautiful burst of color on plate. I sure wish I was having that for lunch today! oh, that looks divine kevin! what a gorgeous mix of ingredients for salad! you know what, I’d love to have you submit either this salad, or the delicious banana-pb-sandwich below for my healthy cooking blog event! Strawberries make such a great addition to a salad, it’s so summery! Yours looks perfect! Healthy and colourful and bet it tastes good too. Wow you’re really cranking out the strawberry recipes… Lots of great savory ideas so far.. Thanks! Not only does that salad sound amazing… It looks pretty, too! I love avocados in salad yumm. I don’t always like strawberries in salad, unless they’re nice and ripe. 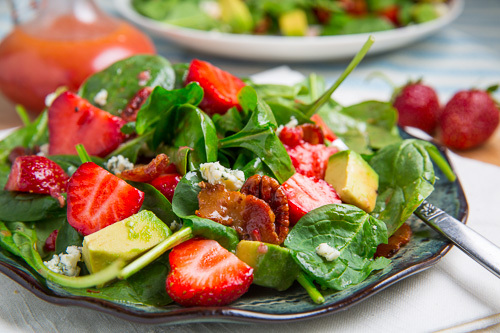 This salad is so pretty – the strawberries and avocados complement each other perfectly. So there I was at my local grocery store standing near the cheese. Ahh yes I have strawberries, what was in that dish that Kevin made. Let me grab some feta. I can not wait to try your other strawberry dish with quinoa. Then I see you have yet another strawberry beautiful dish. Oh Kevin your killing me with your goodness. Can I send my husband to your place for about a week so he can learn from you? Kevin- This salad looks amazing! 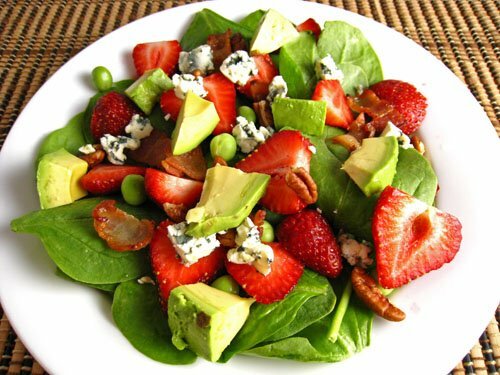 I love the use of berries and nuts in a healthy spinach salad! Perfect for summer! I love strawberries in salad. I have to get some and try this combination. It sounds great! Love the combo Kevin, bacon, blue cheese and strawberries sound amazing. You are playing a lot with straberries and I can see that they look so delicious in a salad. This is very very good! I love the strawberries because it gives a fruity flavor! This recipe looks divine-strawberries and spinach are a great combo! I just linked to your post from the MyPunchbowl free invitations and party planning blog. I stumbled upon your blog when I was looking for a great picture of a salad for a 'Salad Party' I was having… This salad looked so stunning I had to try making it. A few of my friends were skeptical at first when they heard the list of ingredients, but were all blown away when they tried it. It's so delicious, I will definitely be adding it to my regular Summer meals! Thank you for sharing the recipe! This is not only a beautiful picture, but I can't wait to recreate it tonight! Wow, it will pair quite well with my salmon. Yum. Can you please tell me what kind of raspberry vinegar you use? Thanks for the assist! Sandy: I do not really have a favourite brand of raspberry vinegar. The brand that I currently have is Elysee but I am sure that most brands will work. peas and bacon optional? PSSSHAW! I just wound up with a case (like 24 or so) avocados and this is a perfect way to use some! Fabulous salad, Kevin! I love the sound of the dressing. So happy you posted this today – it's the perfect summer salad! I can see why you keep making it year after year! Love all the bright flavors and textures in this eye popping salad Kevin – I can almost taste it! Very beautiful strawberry and avocado salad. Love the vibrant colours. I used to order a lot of raspberry vinaigrettes on my salads but they were always WAY too sweet! This one sounds perfect though! OMG your salad looks amazing. I could eat this daily. I'm not a fan of blue cheese anymore but could replace that with goat cheese, but all the other ingredients sound perfect. Then of course you top it off with a luscious raspberry vinaigrette. Great recipe! I just saved it. Can't wait to make it. That is a stunning salad. I am looking for a new twist for my spinach and this seems to hit the spot. I love how you blended the berries well with the spinach. The bacon is a plus for flavor. Over all, this is a great salad. Thank you for sharing this. What a gorgeous salad! I have a ton of strawberries to use up too! What a very hearty spinach salad. I like the new twist – adding strawberries and raspberries. I never had this combination before. And I give my kudos to you for making use of strawberries in this time of year. This is looking so Yummy. can someone PLEASE post the original recipe from 2003? I lost it and the original dressing was much simpler and just as tasty. This is so yummy! I don't mess with any other recipes anymore. I would love to eat at your house everyday! So delicious this i've tried it several times and particularly love the combo of strawberries with bacon and blue-cheese. oow its so amazing. Good directions, ty so much.